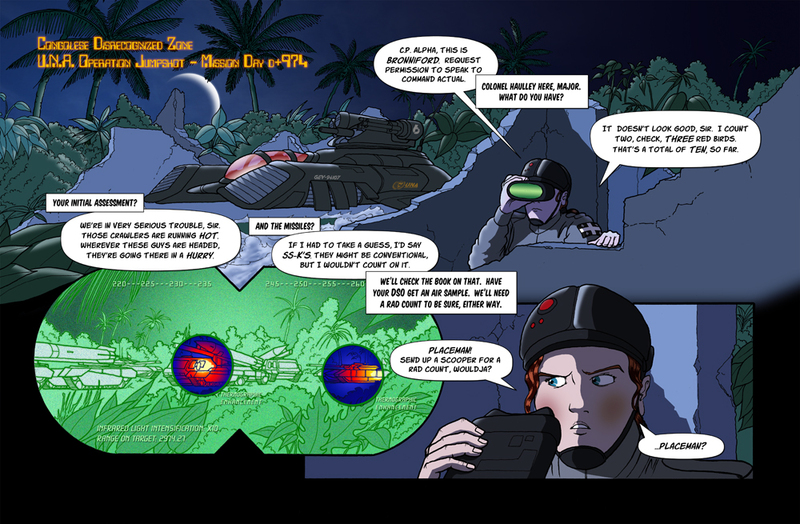 I decided to try to learn how to be more systematic about my work, and so I created a one-shot piece of cheesy military sci-fi with the goal of completing one page per week, from blank sheet to full color and lettering. Hopefully I can sustain it. The story is simplistic, and this is my first foray into full color. So there's lots to be learned on all fronts. At the very least I hope to teach myself some discipline, and apply it to my more serious projects. If all goes to plan I'll post a new page each week 'til this is done. It's fluffy and amateurish, to be sure, but I hope you enjoy it anyway. EDIT: I boosted the test size for web viewing by 20%, after a number of people told me it was too hard to read. I hope this is better. Last edited by Mr. Average on Mon Aug 31, 2009 4:08 pm, edited 1 time in total. Amateurish?!? Are you kidding me? This looks great! This reminds me of the GI-Joe series I watched when I was a kid, although I doubt if the colours in the series hade as much depth in them as your colours have here. Series was from the 80's after all, so I guess the colours were quit flat. In short: can't wait to see more! Wow. Thanks, Joost, that's a tremendous compliment! I was going for an animated look, and actually toyed with flatter color schemes, but the shade and shadow was what I ended up going with. I'm on schedule so far, so the next one will be ready next Monday. I'm glad it's finding a good reception! The next page. On schedule so far! Just a little update: I have jumped in with both feet and set up my own website, both for my portfolio and general work (currently empty) and for 6-Commando which is uploaded and underway. I hope you'll all check it out, as I could use the comments. I'll probably continue posting here as well for convenience sake, though. I hope to see you on my site soon! Next page done, and still on schedule! Visits/comments welcome! Hi M! Website looks great! I'll be a regular visitor. Page 2 and 3 also look great, can't wait to see the next one! Thanks for the encouragement, Joost! Working like this is kind of like shouting into the dark, and it really helps to have a few words like that here and there! 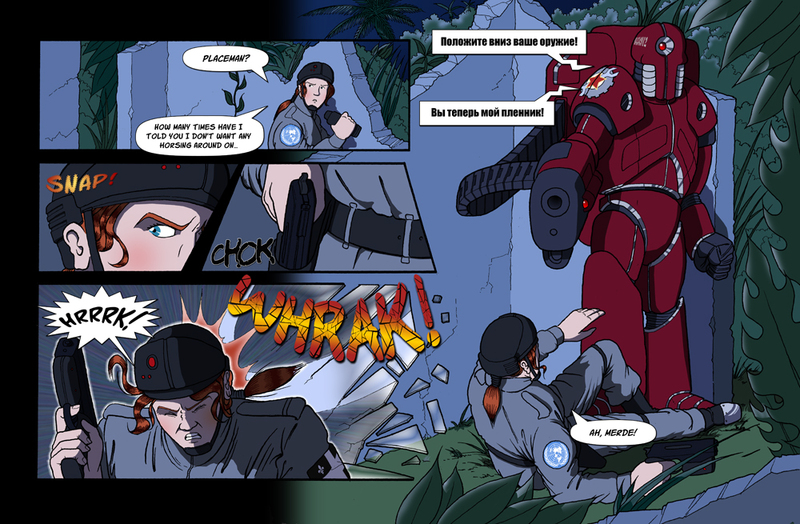 And the next page is up, too, so whoever's interested, check it out! This one-week thing seems to be working out! Great one, love the tank! Thanks, Joost. Unfortunately I missed my deadline this week - sometimes you just get overtaken by events, I guess! I'll troll for guest art next time, maybe. I'm back on schedule! Hooray! And this page is one that really turned out the way I wanted. So please have a look! Great page! Really sets the mood! And using actual Russion is a really nice touch, verry original! Thanks, Joost! It really does help to have a reader out there - even just one! Looking good! I like the richness of your colors and your attention to detail. Looks very clean.